It’s that time of year where all I want to do is bake. It doesn’t help when we have about a gazillion (times three) apples in our fridge from our annual apple picking trip to Carter Mountain Orchard, just begging to be chopped up, sliced, diced, roasted, baked, pureed, and munched as-is! This spice cake uses a combination of apples and pears, nestled into a doughy inside. I used plain yogurt and some spiced apple cider from Trader Joe’s to keep the batter moist, then stirred in some juicy raisins with the apples and pears. Topped with chopped nuts and sprinkled with a bit of brown sugar, and this cake becomes breakfast, afternoon snack, OR dessert! I’d also suggest it with a nice big scoop of my favorite vanilla fro-yo! Note: I used some of these handy little Threshold Oven-safe Paper Loaf Pans that I got at Target. They are the BEST. Especially if you plan on doubling the batch to give a loaf or two away, these are perfect because you can just bake the cake in the pan, let it cool, wrap it up and send it on its way! I first saw these used to display different types of quickbread at a booth at the Durham Farmer’s Market, and the woman selling them told me where she’d gotten them. Best invention ever! They come in the full loaf size as well as a smaller size, and come in packs of 4 ($5.99 for the larger, and $2.99 for the smaller). I got a pack of each! 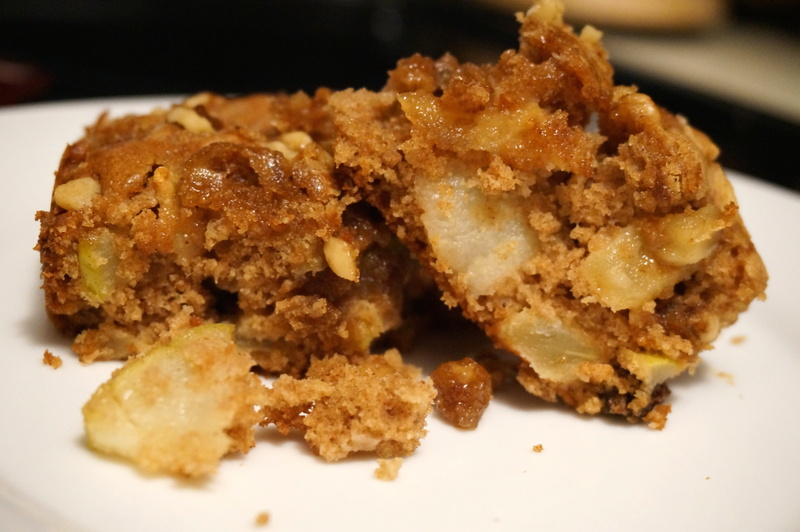 I used plain yogurt and spiced apple cider in the batter of this spice cake, then stirred in some juicy raisins and chopped apples and pears. Sprinkle a few walnuts and brown sugar over the top before baking for a sweet caramelized glaze! Preheat oven to 375. Spray a cake pan with cooking spray or grease with shortening. In a large bowl, beat butter, sugar, and brown sugar until light and fluffy. Add egg and continue to mix. Stir in yogurt and apple cider. In a separate bowl, sift together flour, baking powder, salt, cinnamon, and nutmeg. Add to wet ingredients and stir until just combined. Stir in apples, pears, and raisins. 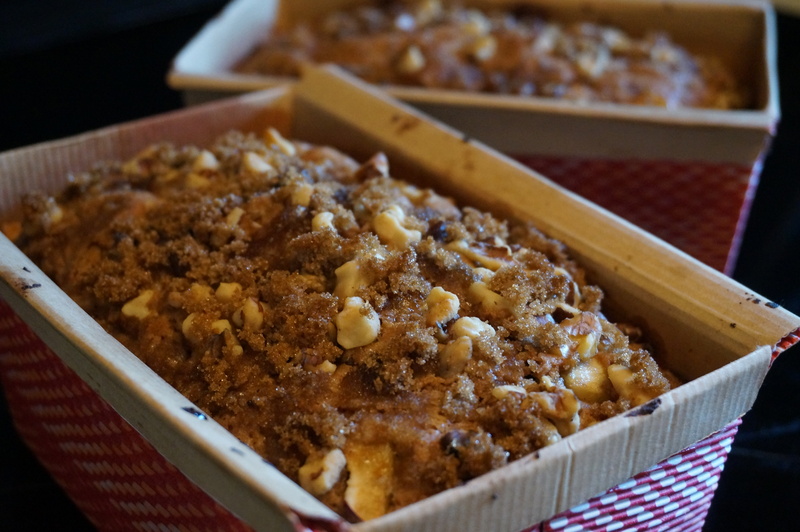 Spread in an even layer in cake pan and top with walnuts and brown sugar. Bake 25-30 minutes, or until top is golden brown and a toothpick comes out clean. Allow to cool at least 5 minutes, then slice into squares and serve! I made this yesterday and it is DELICIOUS! I substituted applesauce for the apple cider because that’s what I had in the house, and it worked perfectly! I had to have a piece while it was still hot from the oven (and it was amazing), but I thought it was even better this morning! (Yes, I’m a dietitian, and YES, I did eat this “cake” for breakfast).